Meet & Greet on arrival at NJP Railway Station / IXB Airport & transfer to Phuentsholing - The Gateway of Bhutan by Roadfrom India. Phuentsholing is a thriving commercial center on the northern edge of the Indian Plains. On arrival check in at thehotel. Overnight at Phuentsholing. After breakfast complete the immigration formalities and transfer to Thimphu (7,710 ft.) the capital city of Bhutan. On arrival check in at the hotel. Overnight at Thimphu. 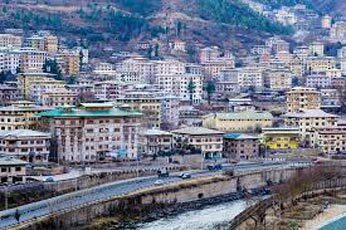 Thimphu the capital of Bhutan is a home of Royal family .After breakfast visit Tashichhodzong ,the main secretariat building which houses the throne room of His Majesty,the king . View of the Thimphu valley from BBS Tower is very captivating and will prove to be the perfect introduction to Thimphu. Some of the sites of religious nature are National Memorial Chorten; built in 1974 it was raised in the memory of third King. Next visit one of the oldest monasteries in the valley- Chang Gangkha Monastery. The nature and wildlife lovers should not miss a visit to National Zoo which also houses national animal takin. National Library (collections of holy scripts) & in the evening visit Buddha point.Overnight at Thimphu. After breakfast drive to Punakha / Wangduephodrang (4,300 ft.), via Dochu-La-Pass (10,170 ft.). Continue towards Punakhavisit Chimi Lhakhang - The Temple of Fertility built in 15th century. 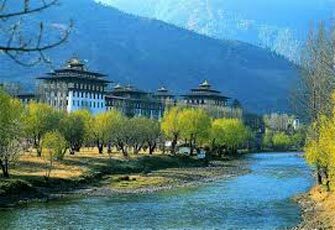 Also visit Punakha Dzong. On arrival check in at the hotel.Evening free for leisure. Overnight at Punakha. After breakfast drive to Wangue Phodrang, visiting Dzong & local market. Its famous for Bamboo product, Slate & Stonecarving. Drive further across Pele-La-Pass (11,120 ft.), traditional boundary between east & west Bhutan. 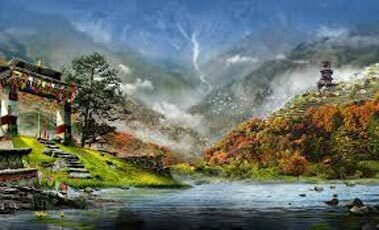 There is an abruptchange in vegetation, with mountain forest replaced by high altitude dwarf bamboo. Stop Enroute Chendbji Chorten. Furthervisit Trongsa Dzong – it was the seat of power over central & eastern Bhutan. Then drive further to Bumthang over the Yutong-La-Pass (11,155 ft.). On arrival check in at the hotel. Overnight at Bumthang. Bumthang is the general name given to the combination of four valleys – Chumey, Choekhor, Tang & Ura. These valleysproduce Honey, Cheese, Apples & Yathra (woolen colorful material). After breakfast visit Jampey Lhakhang, Kuje Lhakhangand Tamsing Monastery. 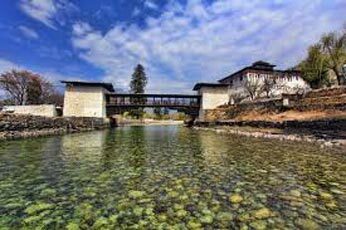 Also visit the Jakar Dzong. Back to hotel. Overnight stay will be at Bumthang. Dzong (Bhutan Victory Fort), which was built in 1646 to commemorate Bhutan's victory over Tibetan invaders during the 1600s. On a clear day you can see Mount Jumolhari, Bhutan's second-highest mountain at 7,314meters.Overnight stay will be at Paro. After breakfast hike to Taktsang (Tiger's Nest) Monastery, which is Bhutan's most famous monastery situated at 3180 meters. Guru Rinpoche (the great spiritual master) is said to have flown on the back of a tigress to meditate in a cave where Taktsang Monastery now stands. 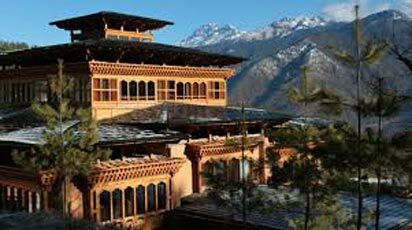 The monastery is perched on the edge of a steep cliff, about 900 meters above Paro Valley.Overnight stay will be at Paro. After breakfast check out from hotel and transfer to Phuentsholing. On arrival check in at the hotel. Overnight stay will be at Phuentsholing. Restricted Area Permit is required to visit Punakha / Wangdue from Home Ministry of Bhutan Please bring 02 passport size photographs and Voter ID card or Passport of each person including child. This special permit is given only after guest has entered Thimphu. Permit are not issued on Saturday and Sunday and Govt Holidays. For Bangladesh National double entry visa is Mandatory. The rates quoted in the packages are on per person basis till 31st December 2015 (High seasons surcharge will be applicable during the Festivals & Peak season). The above mentioned hotels will be confirmed as per the room availability. Otherwise similar category hotel will be provided. 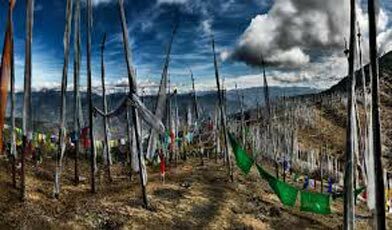 Bhutan is a smoke free country, Smoking and tobacco is strictly prohibited in Bhutan. The booking will be confirmed only after we receive 30% of the tour cost as advance and rest will be paid when the guest start the tour. Additional sightseeing or extra usage of vehicle, other than mentioned in the itinerary will be charged extra. 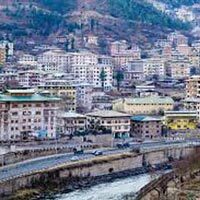 Explore Bhutan - The Lost Shangrila Tour (..
Beauty Of Bhutan Tour (motorcycle Expediti..
Beautiful Bhutan Tour (motorcycle Expediti.. Memorable Bhutan Tour (motorcycle Expediti..
Bhutan At It’s Best Tour (motorcycle Exp.. Experience Incredible Bhutan Tour (motorcy..